Nothing beats a blueberry muffin for breakfast Leanne! Or as a little afternoon treat! 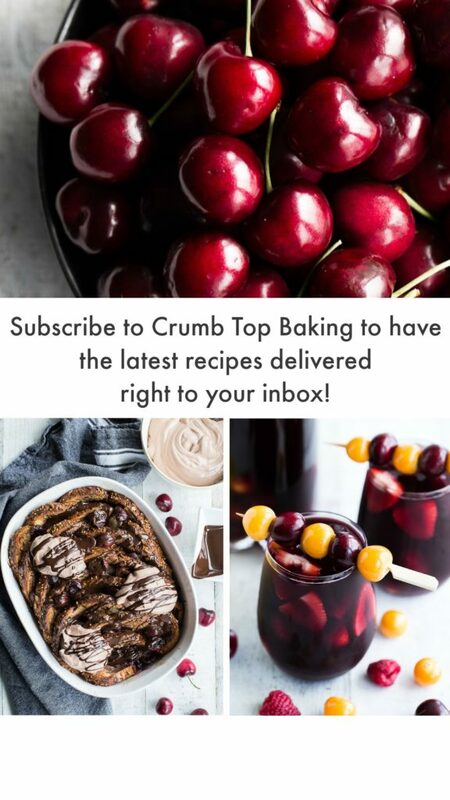 Great addition to Muffin Week! Thanks Mary Ann! An afternoon snack with a cup of tea works for me! Oh wow, that vanilla olive oil looks AMAZING. I’m going to have to order some. I used their peach balsamic recently and it is so good. These muffins look PERFECT and I can’t wait to make them. The next time we buy blueberries, I’m totally making them. Thanks Madison! The vanilla oil is lovely, and great for baking. I recently used their peach balsamic in a blueberry peach salad dressing, and it added a great flavour! 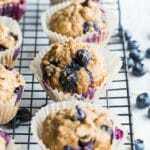 Let me know what you think if you make these muffins! And thanks for organizing Muffin Week! Vanilla infused olive oil sounds wonderful — that would be so great for baking! 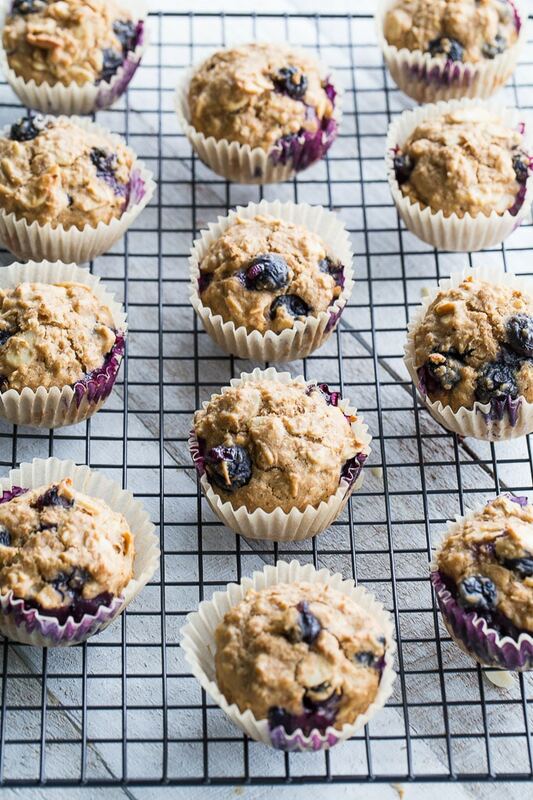 I love making overnight oats so I love the idea to make them into muffins, especially with my favorite berries ever. My kids would love these! Thanks Marcie! 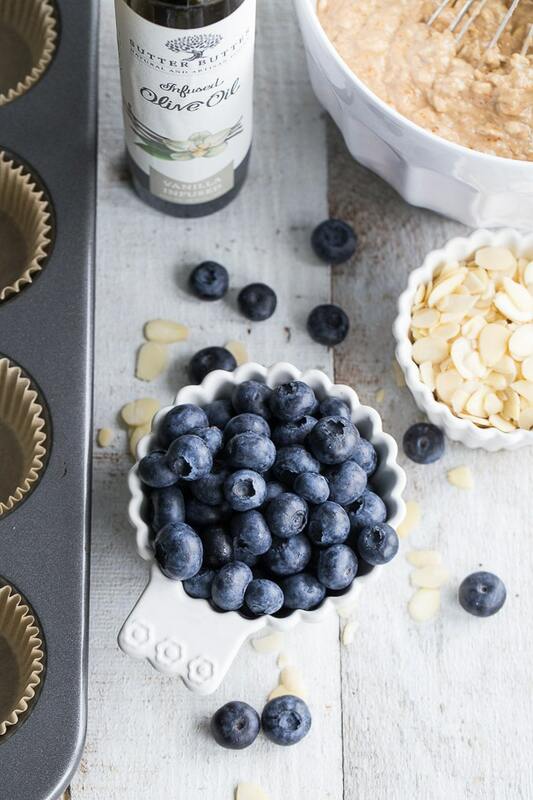 The vanilla oil is great for baking, especially when paired with blueberries! It created a lovely smell in my kitchen! Muffins made with overnight oats? What an awesome idea! And I had no idea that vanilla infused olive oil existed, I’ll definitely be checking that out!! Thanks Lisa! 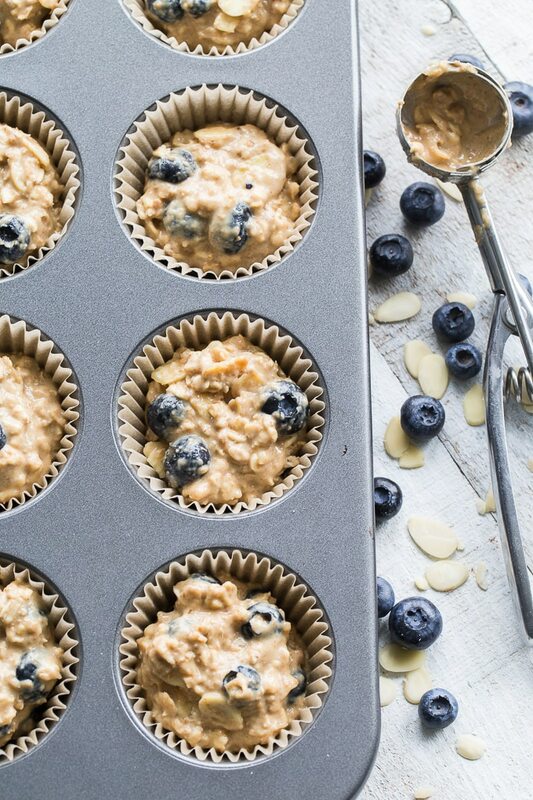 The overnight oats just save a step in the morning, and help keep the muffins moist. I love using different infused oils, and this vanilla one is definitely worth a try! Thanks Ashika! I’m glad you like them. Blueberry muffins are one of my faves too! Blueberries are my favorite fruit to use in baked goods. I love how they burst! Yes, when they burst, it makes muffins and cakes look all the prettier! I love all your tips! I never thought of the overnight oats in muffins. Vanilla infused olive oil sounds wonderful with blueberries and almonds! I can’t wait to try it, so pinning for later! Thanks Leanne! Thanks for pinning Kim! I usually add overnight oats to my muffin recipes. Helps keep the muffins moist and adds a great texture! Have a great week! 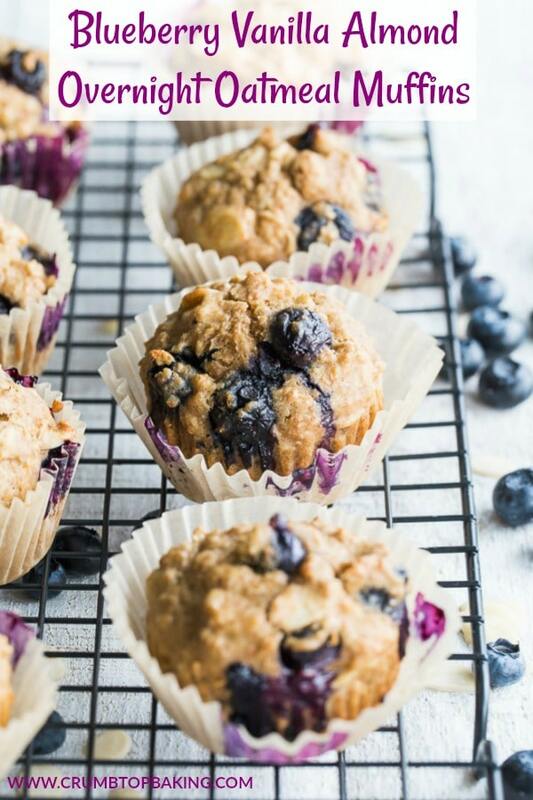 These blueberry muffins look amazing! Perfect for brunch! Thank you Natalie! I agree, these muffins would be great for brunch! These muffins look scrumptious Leanne! Love that they can be made overnight for the morning. I know my boys would devour these! Thanks Tanya! They’re a quick and easy muffin recipe, so perfect for busy weekday mornings! These muffins look so good ! Vanilla infused olive oil, how interesting ! With blueberries and almonds…..oh yum ! And I love the idea of using overnight oats, thanks for sharing! Thanks Vicky! The vanilla infused oil adds a nice flavour and the overnight oats create a great texture! Thanks for stopping by! I was so excited by your teaser picture of these on Instagram! 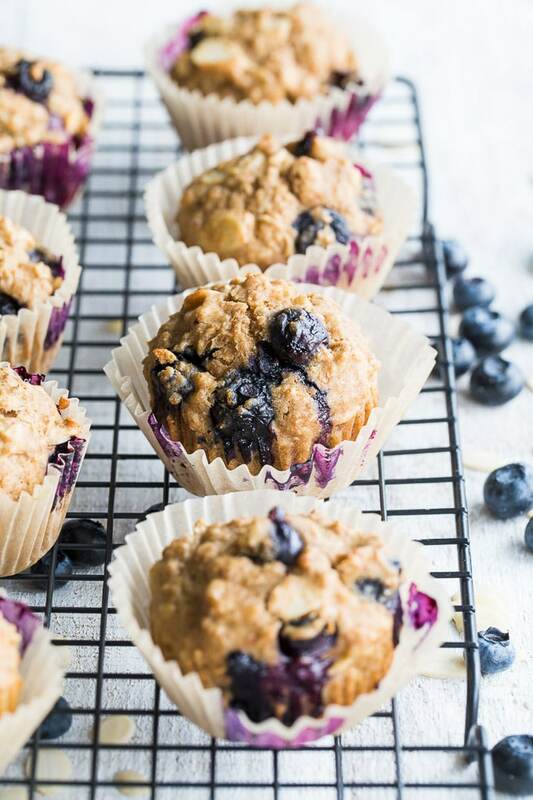 The muffins look perfect and bursting of blueberries! Yum, yum, yum! Thanks so much Kelly! Hope you’re having a great week! In spite of the heat, you are making me want to bake muffins. These look so perfect, and I love the sound of that vanilla olive oil! Thanks Colleen! It was a hot few weeks recipe testing muffins in my kitchen. But I think it was worth it! I often think of combining blueberries with lemon, but blueberries and vanilla sounds heavenly! Pinned! Thanks Elaine! I think it’s a warm and cozy combo! Thanks for pinning! Thanks Dawn! Yes, blueberries are a must like, especially if you live in NL! (Although my hubby doesn’t like them!) And one (or three) of these with a morning cup of coffee sounds like a great idea! Thanks so much Denise! I like being able to do some prep the night before so fresh muffins in the morning are a little easier. I hope you like them. Be sure to let me know what you think! These muffins are drool-worthy! And I want my clothes to smell like them too! Haha! Thanks Lily! It’s not often I like my clothes to smell like food, but I didn’t mind the scent of these muffins! Vanilla infused olive oil sounds absolutely divine! And what gorgeous photos these are Leanne!! Thanks Lizzy! Blueberries are so fun to photograph! And the oil works beautifully in these muffins! Happy Friday!